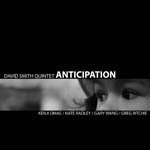 Impetus is the third album from the David Smith Quintet, featuring Smith's working band for the past several years, Dan Pratt on saxophones, Nate Radley on guitar, Gary Wang on bass and Anthony Pinciotti on drums. On Impetus Smith offers six original compositions that explore subtle tensions that drive the music forward. The trumpeter/composer explains, "in several tunes I was looking for a tempo that was laid back enough that it created a subtle tension to move forward, like a spring that is pulled just a bit causing it to pull back." While Smith considers his compositions the foundation of his records, he is intent on finding the point of balance whereby the tune communicates a musical idea but remains open enough to allow creative space for the band to explore. The first three tunes of Impetus make a continuous "suite". "Moments" is an understated, lyrical melody that sets the tone for the album. "Bond" was built upon the last two chords of "Moments" with the intention of them being continuous. Smith elaborates, "as a pair of tunes they sort of needed a foil to balance them out and segueing into "The Toaster" was working on gigs so I kept it. "The Toaster" was written in tribute to a tragically unfortunate mouse." "Seven" borrows its harmony from the Allegretto second movement of Beethoven's Seventh Symphony, resulting in something very different. "Starr St" is about a rough and tumble part of Bushwick, Brooklyn. "Intersection" was another attempt to capture the energy Smith was describing earlier, with the tempo sitting back and the "F" that exists throughout the entire tune creating a subtle but building tension until the last four measures of the recording when it is finally released. Impetus was recorded live in a one-room studio to two-track analog tape, and also mastered directly from the tape; the mixing was completed before the band started playing. Smith wanted to capture the organic nature of the tunes and band dynamic and felt this was the best way to accomplish that. At times Impetus betrays a rock influence, both musically and emotionally. Smith explains, "I feel this is acknowledging a part of where I came from musically, earlier in life. It wasn't a conscious decision, but rather what came out when I tried to write honest music." From the twenty-four minute suite that opens the recording, to the resolution in the last four measures, this is an album in the truest sense. For David Smith, meeting guitarist Nate Radley was the impetus for him to start a band, and he has had the luxury to have him on nearly all of his gigs since the beginning (2005). Smith explains, “we played for the first time at a session at Greg Ritchie's place, and after playing one of my tunes and one of his tunes, I felt that he and I shared a musical compatibility that is very rare.” Radley’s tune “Carillon”, first played at that informal session, is featured on Anticipation simply because Smith loves how it combines musical interest with relative simplicity. “It is beautifully constructed and lots of fun to play on,” said the trumpeter. Smith composed “Bittersweet” (which employs some species counterpoint techniques he was studying at the time) in an attempt to convey some of the complex emotions he was feeling about fatherhood prior to his daughter’s birth. The tune was also influenced by the Ben Monder composition “ Luteous Pangolin”, as played by The Alan Ferber Nonet, of which Dave is a member. The trumpeter began his professional career in Toronto, moving to NYC in 2000 at the urging of saxophonist Kenji Omae. Smith managed to relocate armed with a study grant from the Canada Council for the Arts. Before long he was much in demand on the NYC scene, and is currently a member of almost twenty different ensembles. He was most recently featured on new recordings by Harry Connick Jr., Jon Gordon, and others. His debut album as a leader, Circumstance, was released in October of 2006 on the Fresh Sound New Talent label, featuring his original compositions played by an outstanding quintet featuring Seamus Blake (tenor saxophone), Nate Radley (guitar), David Ephross (bass) and the ubiquitous Mark Ferber (drums). While the roots of the music on Circumstance, and on his new release on BJURecords, Anticipation, is in classic jazz, Smith combines elements of classical harmony and counterpoint resulting in a very original compositional style. His approach to the trumpet is also unique, intervallic and harmonically sophisticated yet lyrical and emotional. In addition to his own recordings, Smith is featured as a sideman on over two dozen recordings including releases for Fresh Sound New Talent (Alan Ferber Nonet, Delphian Jazz Orchestra), Steeplechase (Kim Bock Quartet, Russ Spiegel Sextet) and Interplay Records (Cecilia Coleman Quintet), as well as several independent releases (Paul Carlon Octet, Sarah Lynch, Numinous). He has also recorded for national broadcasts on CBC Radio in Canada and Denmark Radio and appears on two film soundtracks. Smith has also been called upon to record with the likes of Lonnie Plaxico, Billy Hart, Chris Cheek, Lenny Pickett and Tom Jones among others. Smith is an international touring artist, appearing in major jazz clubs around the globe, from NYC to Canada, France, Germany, Ireland, Denmark, Sweden and Haiti. Smith has a Master of Arts Degree in Jazz Performance from the Aaron Copland School of Music in New York, and is an adjunct faculty member at the College of Staten Island, CUNY.